Happy Monday! It’s another week for our Virtual Book Club for Kids and this week’s theme is love! We’re reading The Day it Rained Hearts by Felicia Bond and sharing fun activities about love to go along with the story. Be sure to scroll down after reading this post for more activities based on this week’s theme! This week I’m sharing a hearts sensory bin for preschoolers. The Day it Rained Hearts is an adorable book about a day when it rains hearts and a young girl names Cornelia uses them to make Valentines for her friends. Each heart that falls from the sky is different, just like her friends. 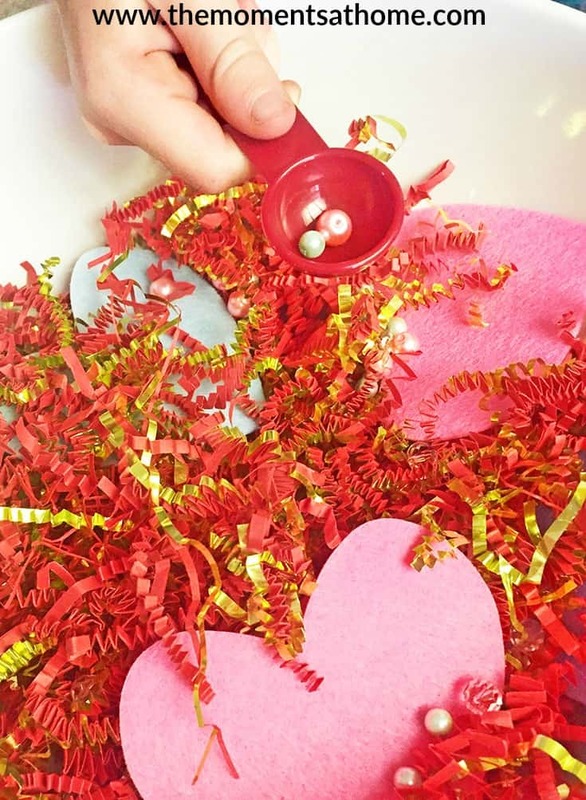 Follow Cornelia as she makes these special hearts into special Valentines. Fill a bowl with the crinkle paper, felt hearts and beads. Kids can use a spoon to dig through the crinkle paper and hearts to scoop the beads making this a great fine motor skills activity.